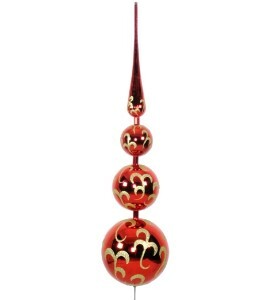 This 70" tree topper is a beautiful, red, shiny ornament with gold glitter accents . It is a unique way to top off your tree. It comes with a thick wire pick that can be used to easily hold it in place. It's glitter enhancement ensures that it will top your tree in style.